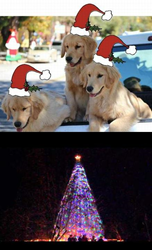 The Golden Retriever Mayor of Southern California’s Mountain Town of Idyllwild, California Invites You to Idyllwild’s 55th Annual Christmas Tree Lighting Ceremony and Festivities. The Tree Lighting event in Idyllwild is a family tradition that we love attending every year. The entire day is magical. Three generations of our family’s children have met the real Santa every year. Mayor Max of Idyllwild, California, his Deputy Mayors Mikey and Mitzi (all Golden Retrievers), his office Chief of Staff, Phyllis Mueller, and the entire community of Idyllwild invite you to attend Idyllwild’s 55th Annual Christmas Tree Lighting Ceremony on Saturday, November 28th -- the Saturday of the Thanksgiving holiday weekend. The annual Christmas Tree Lighting Ceremony in Idyllwild, California continues its traditions with an old-fashioned Christmas celebration that begins at 10:00 AM and continues until about 6:30 PM. Festivities throughout the day delight the community and holiday visitors alike. Visitors have the opportunity to step back in time in a wonderful and magical way, enjoying the beauty and simplicity of this joyous holiday and serene mountain setting. Santa and Mrs. Claus will arrive by fire engine to spend the day and listen to the children’s holiday wishes and dreams. Santa’s workshops are scheduled from 1:00-3:00 p.m. and 5:15-7:30 p.m. or until all the children have completed their visits with Santa and Mrs. Claus. Each child receives a candy cane from Santa. Christmas carolers from the Grammy-nominated vocal ensemble, The Caroling Company, and also local Idyllwild community singers, can be heard throughout the town all day and during the Tree Lighting Ceremony. There will also be live Christmas music played throughout town. Stores open at 10:00 a.m. and stay open a little later to accommodate the holiday-shopping enthusiasts. The stores and town are decorated for the holiday festivities. Downtown streets (Village Center and Park Lane) will be closed from 8:00 a.m. to 7:00 p.m. so that non-profit information booths can offer their holiday goodies galore to the public—including baked goods, other holiday food items, holiday wreaths, ornaments, popcorn, other homemade items, balloons, quilts, pet adoption opportunities, hot chocolate, cider, raffle items, and much more. In conjunction with the Pine Cove and Idyllwild Fire Departments, the SPARK OF LOVE Toy Drive will be collecting toys for the less fortunate. Live Christmas music and Christmas carols are performed with audience sing-alongs. The performances begin with the children, ages 3-6, singing three of their favorites (“Jingle Bells,” “Rudolph the Red-Nosed Reindeer,” and “Santa Claus Is Coming to Town”). The Ceremony includes special performances by The Caroling Company and local Idyllwild choir. The Ceremony is concluded with the lighting of the 100-foot-tall tree just after sundown and the performance of additional Christmas carols with sing-alongs. The tree is lit with over 5000 lights to make this year’s tree the brightest ever in its history. Mayor Max, Idyllwild’s canine Mayor, and his canine Deputy Mayors Mikey and Mitzi, will also be attending the event and will be available for visits and photo opportunities with everyone. To find out more about the Idyllwild Tree Lighting Ceremony, visit http://www.mayormax.com/tree2015.htm. To find out more about the Mayors of Idyllwild, visit http://www.mayormax.com and http://www.facebook.com/mayor.max.3. Idyllwild's 2015 Christmas Tree Lighting Ceremony ProgramView this year's program and see all of the happenings on this traditional day.